I am not too proud to show you my latest knitting efforts. I even put all the details on my Ravelry page – but really, does anyone out there not know the details? LOVE the colors of that ballband cloth. At least YOU finished something. That I can not claim about anything around here!! Lovely, lovely colors! Perhaps the mojo is busy making something else great! I feel a strong feeling–what is it? oh yes! SMUG would be the feeling. How the mighty knit dishrags–would be another way of describing the feeling. I will have to try the garterlac. There is no shame in dating other dishrags. I have an uber personal question. Can I see the backside of your garterlac dishcloth? I’ve tried to make that so many times but keep giving up because the back looked funny. I want to see what the back of somebody else’s looks like. Please??????????? 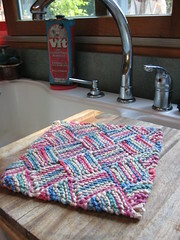 Love the dishcloths, maybe your mojo will be back when the weather gets cooler. 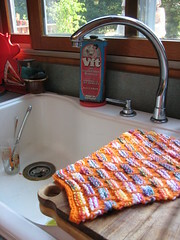 When the going gets tough, the tough knit dishrags. Yeah!